Say goodbye to bland baked chicken breast. I want all you to see that you can easily dress up chicken, there is no need to eat a boring, dry chicken breast ever again! This specific recipe combines delicious Italian flavors with mozzarella cheese, spinach, roasted red peppers and basil. I chose to make my own sauce at home, but you can easily use a jar of white sauce or tomato sauce if you don’t want to spend the time making your own. 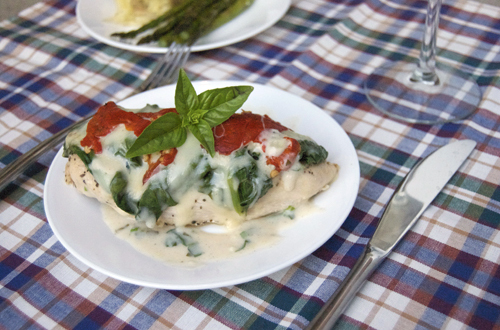 If you are watching your diet, make this recipe with non-fat mozzarella and leave out the sauce or use tomato sauce. Preheat the oven to 375F. Place the chicken breasts on a foil-wrapped baking sheet. Season chicken with salt, pepper and basil. 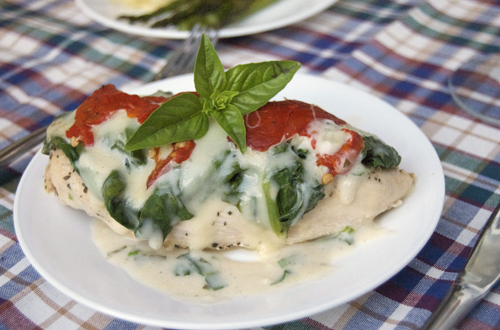 Layer each breast with ½ cup spinach, ¼ cup mozzarella and roasted red pepper slices. What a yummy meal! It looks so colorful and beautiful too! Oh this looks so yummy! I want to eat it right now! lol. I’m so saving this. Thank you for sharing! It’s always great to find delicious and easy recipes and this should go right to the top of the menu! This sounds so comforting and delicious! And pretty too! I love chicken and with some fresh mozzarella and peppers, that is the perfect combo! This is simple but looks tasty,no excuses not to try this. Wow this is probably the best looking baked chicken I have seen in a long time!! Congratz for the top 9 on Foodbuzz! ooo wow this looks so good!